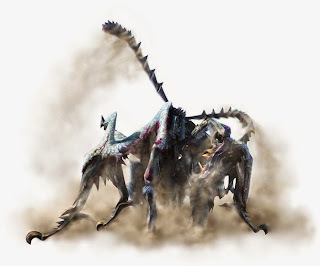 The camouflaged Nerscylla is a subspecies of normal Nerscylla in Monster Hunter 4 Ultimate (3DS). You encounter this monster in a quest level 10 in offline mode. In appearance the subspecies looks just like the normal Nerscylla. However, the subspecies is covered with a shell of Khezu-skin, which makes him appear bluish. The greatest weakness of the camouflaged Nerscylla is fire-and-ice-element weapon, which is why it would be advantageous to use these. The camouflaged Nerscylla uses any material which makes you life but with a lot of state attacks difficult. So it can poison you very strong, paralyzing and cocoon with cobwebs. Body parts that can destroy while disguised Nerscylla are his face, his fangs, his abdomen and his back, can destroy you even twice. Besides the fact that the attacks of the subspecies are stronger and the monster more than a normal life has Nerscylla, has not really changed much in the fight. The camouflaged Nerscylla will often jump into the air and rapidly shoot with its cobwebs to you. It is also just so shoot you with his cobwebs that cocoon you, so that you can move only limited. The subspecies may also poison with many attacks you. So he bites for example, with its giant fangs to you that you pull a lot of life and poison strong when you get hit. From time to time he will also tempt you to stick with his poisonous sting at the back of the body, what you also poisoned. A new capability of the camouflaged Nerscylla is that it can dig into the ground now. Once he dugs, he appeared again and grabs you from below. He catches you, you will suffer much damage besides a strong poisoning. So take with a lot of antidote to battle. The spine on the back of the monster is again specially dangerous because they paralyze you if you get hit by them. Swings the monster namely eg with its cobwebs over you over, he can get you with these spikes and you will paralyzed, so that you are completely unprotected for a few seconds. The white Monoblos is a subspecies of normal Monoblos. 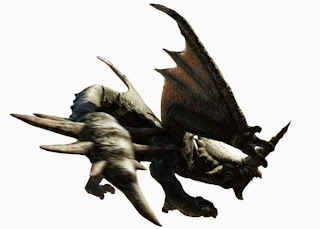 You will encounter this subspecies in offline mode in Monster Hunter 4 Ultimate (3DS) while a level 10 quest. As the name suggests, the subspecies is distinguished by its white tank color from the normal version. His armor is also harder than a normal Monoblos, whereby his defense is stronger and a higher degree of severity is required and get through the armor. You should take in the fight against the monster a thunder-element weapon, since they cause the most damage to him. The white Monoblos sets in the fight itself a no elements or any state attacks. Destructible body parts of white Monoblos are his horn, his back and his tail, which can be separated with bladed weapons. The white Monoblos is probably one of the most boring subspecies that exist, because it is no different from the normal Monoblos in combat. He uses exactly the same attacks as the ordinary relatives, which you are actually already well prepared for the white Monoblos since you probably still know the attacks. Most of the time the monster with his horn to run ahead of you in order to knock you around. This he will do constantly. If you stand behind him, he is also sometimes beat you with his tail. The white Monoblos can of course also hide in the ground. Once he done this, he will appear among you to inflict as much damage to you. Once he enters the rampage mode, the monster is much more annoying. In this state, he has red spots on his head. Now he attacks much faster and more aggressively. Often this makes it difficult to dodge all his horn attacks. The weakness of the white Monoblos is the same as the normal Monoblos. So take with some sound bombs. If the monster is now buried, you can throw, so that the monster jumps out of the ground and stuck a sound bomb. Now you can attack him undisturbed for some time. However, this will not work if the monster is in rage mode.